Find Taoro Park in Puerto Cruz on foot or, by car. 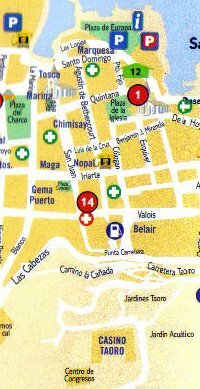 Turn first into Calle Quintana off Plaza del Charco which is the center place in the middle of Puerto Cruz. Calle Quintana climbs just ever so slightly. It's by the Heladeria Pingüino which is an ice cream parlor in the corner of a large building where many people sit outside under umbrellas. 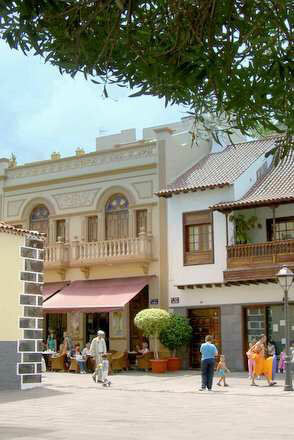 The ice cream parlor with Puerto de la Cruz best ice cream is part of one of the best north Tenerife restaurants. After passing Calle Agostin Bethencourt on your right you will be on your way to find Taoro Park once you reach the tall Church Pena de Francia on your right. Take the steps up to its place. Cross it until you See Café Ebano. The café has wicker chairs outside. It is the one in the photo beside. Cólogan and, all you do is continue the walk past quite a few pretty Tenerife shops to Taoro Park going straight. On the top you come to a square with many parked cars. Go ahead and, turn right. 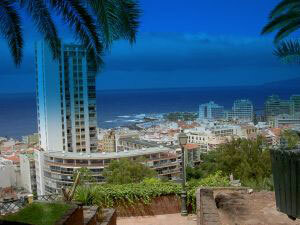 You will see a tall skyscraper on your left which is a landmark apartment house for Puerto de la Cruz. to find Taoro Park without my directions. It's not only a skyscraper but, it was also built in more elevated position. Keep going straight, cross two roads ahead of you. To reach Taoro Park from here is most easy. Follow the steps until you see the waterfalls where you are already in parts of Taoro Park. There is another way if you don't like all the steps. A pathway may also be taken to walk to Taoro Park. It serpentines and makes the walk less steep. Mind please that the waterfalls are already part of Taoro Park. How find Taoro Park with a rented car? To get to Taoro Park by car. Look out for the light green service station opposite the sky scraper building. Turn right at the traffic lights there. Follow Carreter Botanico for a few meters. There will be a road on your left taking you up to Taoro Park. How reach Taoro Park by cab? Call Felix, who is best equipped for large and short Tenerife excursions, groups etc. He speaks English and, he is a good guy. Phone: 609 12 90 04. Give him my regards from Gabriella, the Alemana... I am so sorry. A few days ago he told me that he only will be working at night. Perhaps his day partner speaks English. Please, look at the map below as well. Sorry, I owe you a correction. to get to Bel Air. The whole area here represents much of Tenerife Culture and Tenerife history. Back to Taoro Park for Tenerife things to do Taoro Park, a suburb of Puerto de la Cruz has many best Tenerife hotels. It also has one of the very best Tenerife views of the oldest resort of the biggest but not most populated Canary Island. This north Tenerife suburb would be my dream for a holiday home in Tenerife. Why? It's so green, so quiet, so ideal for walks. Also, my favorite garden restaurant is there.